It’s an early winter morning, dark and chilly, but Northland dairy farmer Jane Hutchings couldn’t be happier. With husband Roger, Jane Hutchings is one of dozens of dairy farmers helping achieve the Kiwi Coast dream of thriving kiwi, roaming freely throughout Northland, nurtured and cared for by local people. Kiwi Coast got underway five years ago, building on work done by the Landcare Trust when Helen Moodie, who is now DairyNZ’s Northland sustainability specialist, provided guidance to people keen to look after the kiwi that were increasingly appearing in their backyards. Kiwi Coast is a collaborative initiative involving more than 120 entities, says coordinator Ngaire Tyson. Community led groups including dairy farmers, other farmers, lifestyle block owners, other land owners, landcare groups, schools, iwi and hapu make up 105 of the initiatives, with the remainder Northland agencies and businesses, including forestry companies. Ms Tyson, who previously worked with Ms Moodie at Landcare Trust, says the recipe is a simple one – landowner engagement, good pest control and good dog control. Key predators for kiwi are stoats which kill 95 percent of kiwi chicks before they reach their first birthday. She says while dogs might be man’s best friend, they are the biggest threat to adult kiwi and this is why Kiwi Coast and its affiliated groups take every opportunity to help dog owners control their animals. She says farmers, as landowners, are vital in Northland’s kiwi protection work. She adds that kiwi can do really well on farms. “Many farmers, have fenced off bush, wetlands and stream margins to exclude stock, which helps protect kiwi habitat. Mrs Hutchings, whose family dairy farm is near Kerikeri, says having kiwi – ‘our national icon’ – living and breeding on their farm is inspiring. “We’re blessed that so many people in Northland have the same passion to protect kiwi. The Hutchings quickly learnt the major threats to kiwi were pests and uncontrolled dogs. With support from Northland Regional Council (NRC), they pulled together a pest control group of farming neighbours and others in their immediate area, and so the Puketotara Landcare group was formed. The group now protects kiwi in an area covering more than 5,000 hectares, stretching from Kerikeri to Puketi Forest. Mrs Hutchings says NRC was a huge help in setting up the Puketotara group, as it has been with other similar groups around Northland. She adds the group also receives funding from Kiwis for Kiwis, as well as Fonterra’s Grass Roots initiative. Puketotara Landcare’s proximity to Kerikeri has inspired a Christmas party each year that helps garner support from lifestyle block owners and urban residents. “We all know how lucky we all are to have kiwi in our backyards, and many people go away from the party in charge of a few traps. Another dairy farming family working to protect kiwi on their own land and inspire others is the Imeson family at Hukerenui. Judy Imeson is administrator of the Tanekaha Community Pest Control Area, and says her inspiration to protect kiwi came from neighbour Edwin Smith, who was a dairy farmer at the time – and a hardy adult male kiwi they named Two Toes. “After recuperating at Whangarei Bird Recovery Centre, Two Toes was fitted with a monitor and released. In 2016, with the arrival of 12 juvenile kiwis in the pest controlled area of Tanekaha it was decided to remove Two Toes’ transmitter, and allow him and Binky to live out their natural lives. Mrs Imeson says the Tanekaha group employs Mr Smith to trap in its control area. Along with pest control, the Kiwi Coast groups monitor their kiwi to gauge the success of their projects. Some groups have permits to fit transmitters to a handful of breeding males to monitor movement and nesting activity. Almost all groups participate in the annual Northland Kiwi Call Count Survey organised by DOC, listening out at night for the male and female calls in early winter. They know their kiwi are doing well and growing in numbers when they hear an increased number of calls each year. Kiwis call during the hours of darkness to mark their territory and stay in touch with their mate. One of the simplest ways to locate kiwi is to listen for their distinctive, piercing calls, which can travel more than a kilometre. Kiwi Coast and many of the groups involved have websites and Facebook pages where a range of information is posted. This includes handy hints on pest control and details of when and where kiwi are to be released to begin new lives in pest controlled areas, as well as videos of kiwi filmed with trail cameras, and photos of birdlife and bush. “By far the best way to enthuse people and get them involved is the kiwi release events,” says Mrs Imeson. Another group linked into Kiwi Coast is Backyard Kiwi which has been working to protect kiwi at Whangarei Heads for 20 years. Backyard Kiwi covers the peninsula’s 6,000 hectares of mixed dairy, beef, and lifestyle block land. In the past 12 years alone, the group has turned the area into a kiwi stronghold, taking the kiwi population from 80 documented birds to more than 900.
with Georgie, one of the 900-plus kiwi roaming freely in the Whanganui pest controlled area. 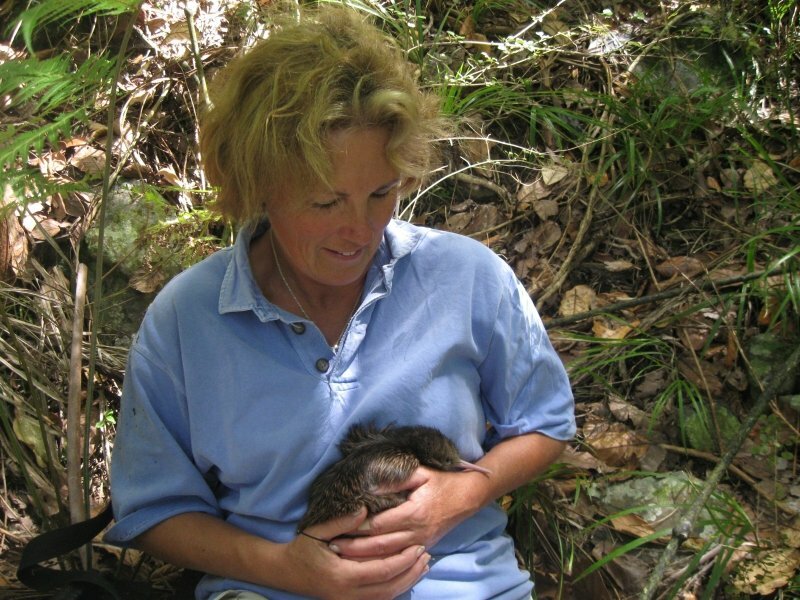 Dairy farmer Jane Hutchings with a kiwi in the Puketotara Landcare area near Kerikeri – “we’re blessed that so many people in Northland have the same passion to protect kiwi”. The Hutchings: The Hutchings family milks 700 pedigree Ayrshire cows on 282 hectares of pasture. More than 30 kilometres of fencing protects a 20-hectare wetland that is graded ‘significant’, and 100-plus hectares of regenerating-to-mature native bush. Their environmental care also includes a 22 kilowatt solar panel system on their cow shed roof, and they were Northland supreme winners in the 2014 Ballance Farm Environment awards. Mrs Hutchings now chairs the Northland awards committee and manages the Puketotara Landcare group Facebook page. She also invites kiwi enthusiasts to follow her Browncowkiwi. The Imesons: The Imeson family milks 600 cows (300 in spring/300 in autumn) on 520 hectares. Waterways on the farm are fenced, and an effluent irrigation system in place. 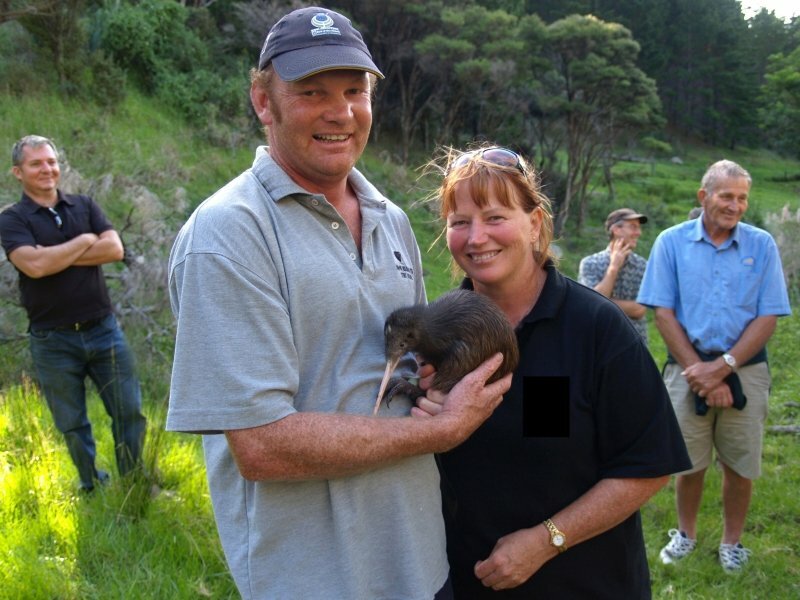 The family’s kiwi protection work is inter-generational with three adult sons and their families involved – the grandchildren, in particular, enjoying kiwi releases.